You’ve probably enjoyed various versions of this party-favorite – Deviled Eggs before. 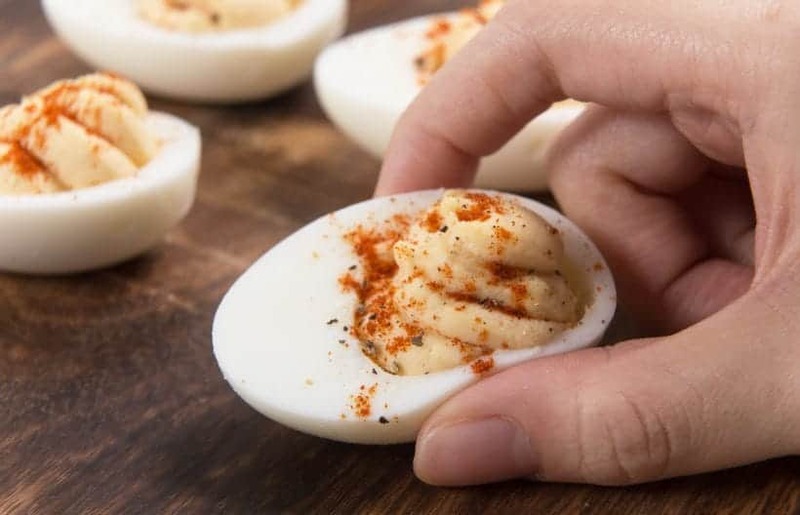 But, have you ever wondered why they’re called Deviled Eggs? This creamy, rich, fine crumble mesh bite of deliciousness has roots back to ancient Rome. Where they enjoyed boiled eggs seasoned with spicy sauce as the first course of their meal. Of course, it was not the exact same recipe we enjoy now at parties & gatherings. But, the term “deviled” didn’t appear in print until 1786. In culinary, “deviled” referred to dishes with hot ingredients or those highly seasoned and broiled or fried. And “deviling” was coined to describe the process of making food spicy. Hence, these spiced stuffed eggs are named the “Deviled Eggs”. Place 1 cup of cold water and a steamer basket into the pressure cooker. 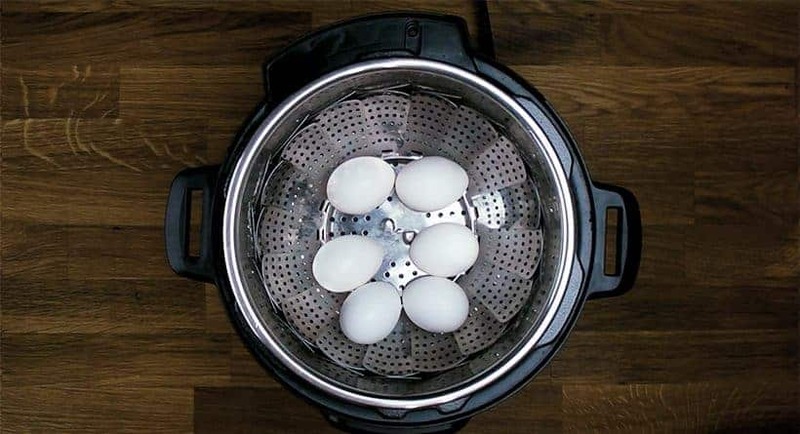 Place the large eggs onto the steamer basket, close the lid. Peel the eggs under cold running tap water and stop the cooking process by submerging the eggs in a cold water bath for roughly 5 minutes. 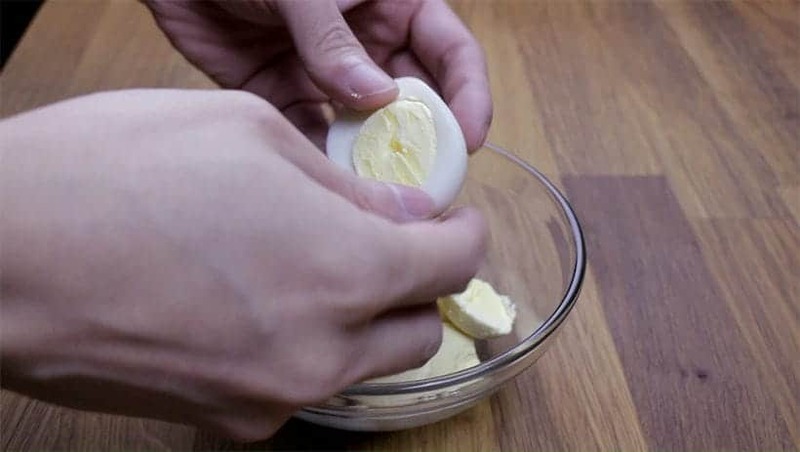 Slice the cooled hard boiled eggs in half. Carefully remove all the yolks in a small mixing bowl. Smash the yolks with a fork. Set aside the egg whites on a plate. Add mayonnaise, extra-virgin olive oil, Dijon mustard, white vinegar, and Sriracha to the smashed egg yolks. Mix well. Taste and season with sea salt & ground black pepper if necessary. Place the dressing mixture in a small ziploc bag, cut a small corner with a pair of scissors. Then, pipe the dressing mixture into the egg whites. 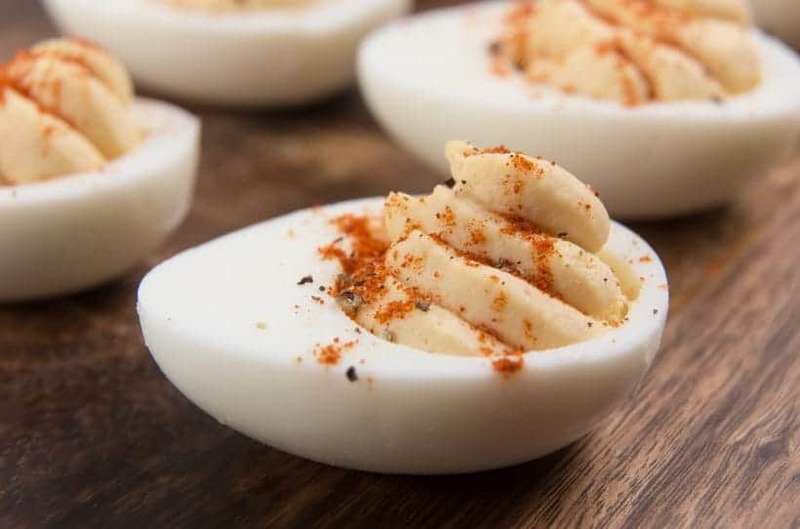 Sprinkle paprika onto the deviled eggs, season with ground black pepper and sea salt. 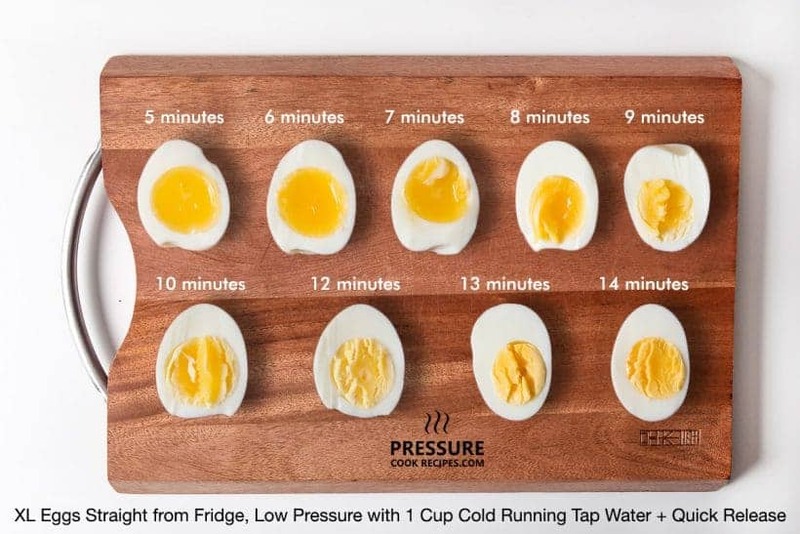 Cooking Time for Hard-Boiled Eggs: we did a little Instant Pot Hard Boiled Eggs cooking eggsperiment with some extra large eggs and got these results. Find your favorite cooking time for your deviled eggs. 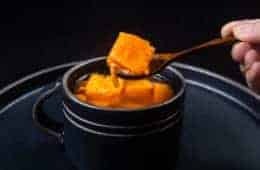 Make creamy & rich Easy Instant Pot Deviled Eggs with a tad spicy twist! Our crowd-pleasing go-to party appetizer. Budget-friendly, simple & delicious. 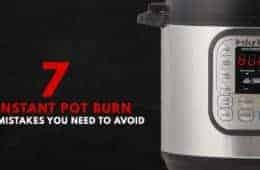 Make Instant Pot Hard Boiled Eggs: Place 1 cup of cold water and a steamer basket into the pressure cooker. Place 6 - 8 large eggs onto the steamer basket, close the lid. Pressure cook at Low Pressure for 12 minutes + Quick Release. Open the lid carefully. 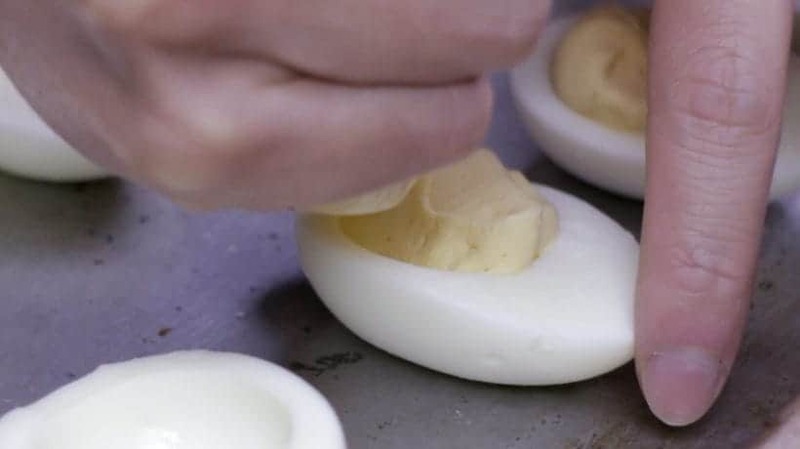 Remove the Yolk: Slice the cooled hard boiled eggs in half. Carefully remove all the yolks in a small mixing bowl. Smash the yolks with a fork. Set aside the egg whites on a plate. Make the Dressing: Add 2 tbsp (30g) mayonnaise, 1 tbsp (15ml) extra-virgin olive oil, 1 tsp (5g) Dijon mustard, 1 tsp (5ml) white vinegar, and ¼ - ½ tsp (1.25g – 2.5g) Sriracha to the smashed egg yolks. Mix well. Pipe the Dressing: Place the dressing mixture in a small ziploc bag, cut a small corner with a pair of scissors. Then, pipe the dressing mixture into the egg whites. 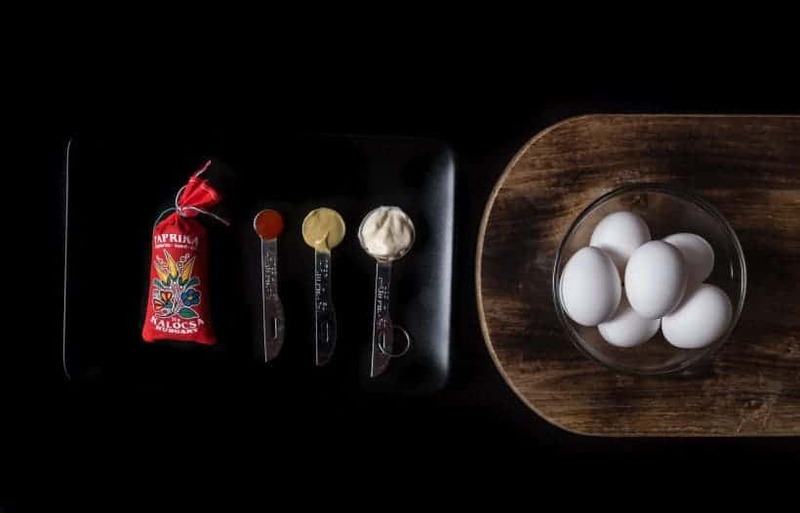 Garnish the Eggs: Sprinkle paprika onto the deviled eggs, season with ground black pepper and sea salt. 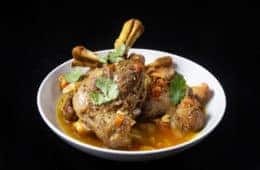 Want More Party Food Recipes? thank you for all your wonderful recipes! 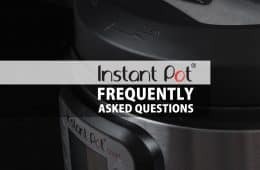 this is the site I use the most for anything and everything instant pot! please keep adding all your great detailed instructions in more recipes 🙂 all the best! This recipe saved the day. I was helping my friend get ready for her holiday party. I noticed she had devilled eggs on her list. I asked about it and she said, no time to do that now. 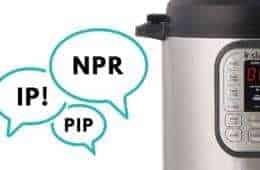 I said, there is if we use the instant pot. She went to get dressed and while she was gone I made these. She was so impressed and everyone loved them. 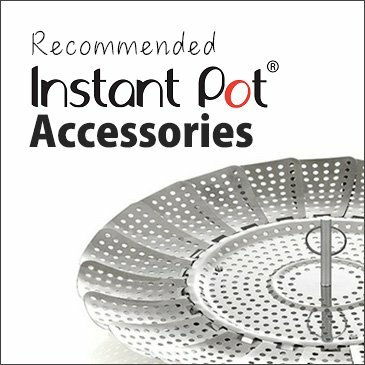 Thank you for your kind comment 🙂 Happy to hear the Instant Pot saved the day! Hi Amy and Jacky! Great recipe…I just finished my eggs for a Xmas party potluck tomorrow. Thank you for all the research, recipes and website! I reading your emails and fabulous photography! Hope you had a wonderful Xmas party potluck! The deviled eggs turned out perfectly! Thank you so much! I keep trying to cook according to your times provided, but I have yet to get good results. My eggs are never perfect. I am using the duo80 model, am I supposed to adjust the time for the 8qt size? the difference between 8qt and 6qt will not make too big of a difference. Make sure to use low pressure and 1 cup of cold water. If you are using large eggs, it will take 1 minute less. Or you can do high Pressure at 8 minutes + Quick Release for large eggs. Love your work but hate the pages being swamped in ads. Kind of forces me off the page when using my laptop. We are working with our ad company to find ways to reduce the # of ads. Every recipe I try of yours is amazing!!! 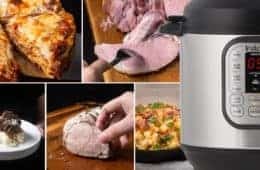 Thank you so much for all the great recipes and helping me learn the art of pressure cooking! Love you guys! You are so kind and your comment made our day!! This was perfect timing as I was going to look up deviled eggs to make for an Easter Brunch so imagine my surprise at finding your recipe this morning. My only question, and you may not be able answer in time for this morning’s brunch, but would you change the time for 12 eggs? It’s a large brunch and I want to take at least 24. Also, love the idea of adding Sriacha. Thanks for all your experimenting and Happy Easter. The timing will work for 12 eggs! Loved the recipe. Served it at a Christmas party and they were snapped up right away. Your timing in the recipe is spot on. 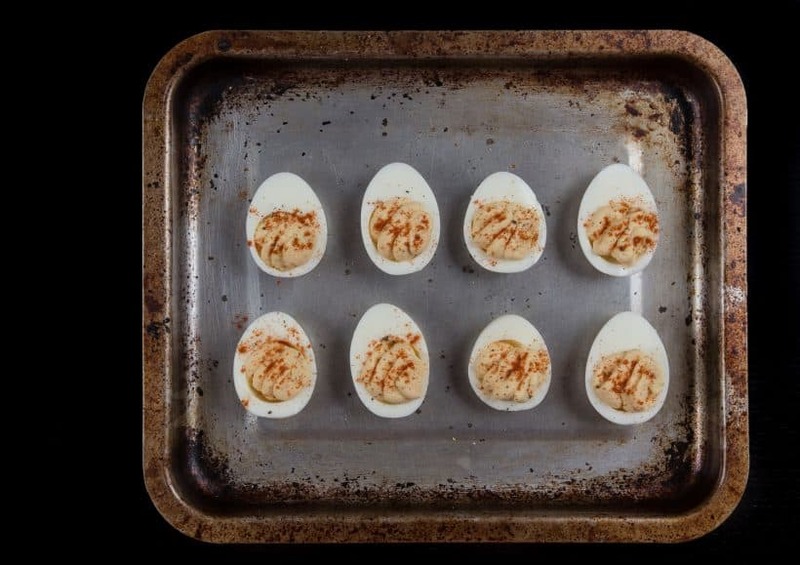 I will definitely be making deviled eggs this way from now on. Thanks for the recipe and detailed instructions. Also made your garlic mashed potatoes which are fabulous. Thank you for your work.